If you are suspecting that someone has gotten into your account without your permission, checking Gmail login history will come in handy. 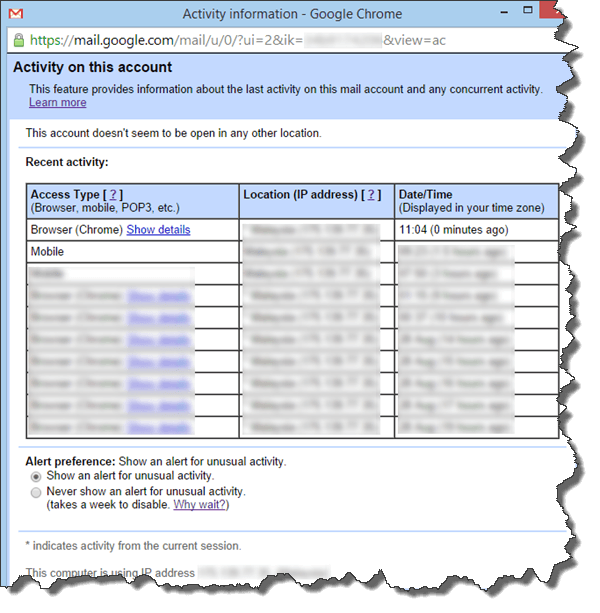 Gmail login history, or what they call it, the last account activity will show you information about last login activity on your Gmail account as well as any concurrent activity. To see your Gmail login history or recent sign in activity on your Gmail account, login to Gmail. At the very end of any Gmail page, click on the Details beside “Last account activity”. It’ll then open up a new window and that is what you were looking for. It shows all kinds of login activities in your Gmail account, including types of access such as browsers, mobile phones, POP3 email clients, etc, IP addresses and their respective locations of where the last login was performed, as well as the date and time of the log in attempts (will be displayed in your time zone). If you want to see a thorough login activity of your entire Google account, visit security.google.com and click on the “View all events” under Recent Activity (or via Google.com homepage > profile icon > Account > Security > View all events). It shows pretty much the same things as the one accessed from Gmail page, with additions of in depth last login locations (with Google Map) and the platform (Operating system such as Windows and Mac) used to login to your account. 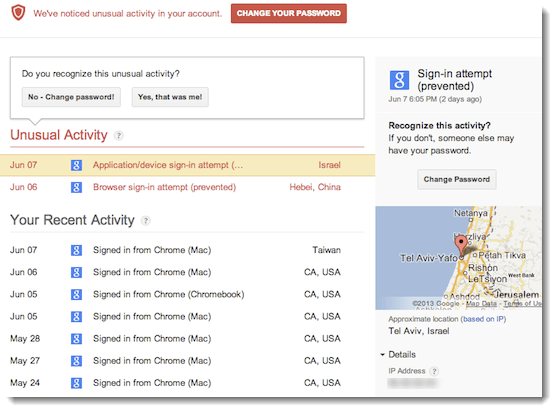 Google will send you alert when they detect suspicious login activity in your Gmail account. Things like a sudden far away login attempt will usually trigger the alerts. Well, if you travel a lot and are sure that those www.gmail.com sign in attempts were yours and is no way a threat, you can just turn off the alert (doing so is not recommended) by going to Gmail login history (the one from Gmail page), then select “Never show an alert for unusual activity” under Alert preferences. Well, the very first thing to do is to change your password immediately. Make sure your password is strong and complicated enough to keep away from hackers. We have previously written about 5 good tips to create a strong password; You may want to have a look at that. By only changing your password doesn’t guarantee that your account can be secured from the next attack. Next thing to do is to enable the 2-step verification for your Google account. What it actually does is that it will send you a code via SMS every time you (or anyone else) do a www.gmail.com sign in or from any where of your Google account. The sign in process will require you to enter this code in order to login to your Google account. With this enabled, you can be insured that no one else get to login to your account without the access to your mobile phone (which I suppose will be with you all the time). Depending what causes your account sign in info to leak, you should eliminate every possible threat. Well, the very first thing is to make sure you Log out every time after you’ve done using your Gmail on a public computer (that everyone else can use such as those in a hotel lobby or a cafe in an airport). One of the most common reason of people’s privacy get exposed is that they have malwares, trojans, or even worse, viruses in their system. If that’s the case, you should scan your system for viruses and eliminate them.